It's a tragic romance: Martin is truly in love with both his wife and a goat. Named Sylvia. Hard to believe? If one is to mount a successful production of Edward Albee's The Goat, or Who Is Sylvia?, it's vital that the characters and their situation seem real, feasible. But as presented by the Repertory Theatre of St. Louis, the people and the world of Albee's play seem fake, contrived. The vital question here is not Who is Sylvia? but Why Should We Care? The first scene introduces us to the healthy, wealthy and happily married couple, Martin (An-derson Matthews) and Stevie (Carolyn Swift). Except something is wrong. No, it's not that Martin is forgetful and preoccupied. It's not that Stevie is unconcerned about her husband's mental lapses. It's that they talk about being in love but never seem to actually be in love. Their wordplay sounds like dramatic dialogue, not spontaneous conversation between two people who enjoy each other's company. In fact, they both seem to be somehow aware that they're acting in a tragedy. Before it's actually arrived, the gloom to come has already pervaded their sunny, spacious living room. And then the plot device -- I mean the so-called best friend -- arrives. Ross (Bruce Longworth) is a shallow TV-show host, coming to congratulate and interview Martin, who has just won a major architectural award. Ross exists in this play so that "the big secret" can be revealed, and he does his duty. Again, though the men talk about their friendship, it never seems genuine. Adding to the fake feeling of the whole scene with Ross is director Steven Woolf's odd choice to have the men sit on the coffee table. Distracting, obviously theatrical choices like this one plague the entire production, serving to distance us even further from the play's dramatic potential. A beautifully lit moment of silence starting Scene Three evokes more emotion than all the screaming has done so far. Peter Sargent's lights silhouette Martin, sitting in his demolished living room, contemplating his destroyed life. Clint Zugel, as his son, turns in the best performance of the show, playing Billy's confusion and genuine love for both of his parents in heartbreakingly honest fashion (in spite of such melodramatic lines as "What have you done with my mother?"). 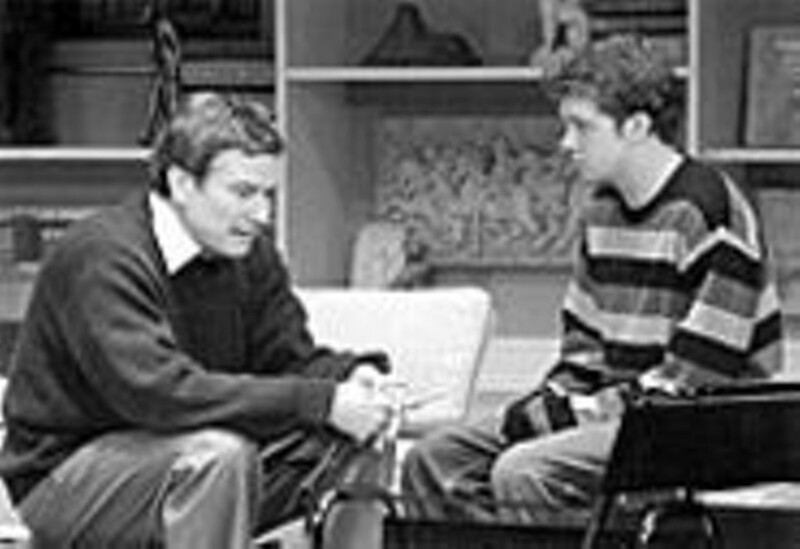 When the father-son discussion is interrupted by Ross, the play turns genuinely ugly, as Martin's attempts to reassure his son are turned by Ross into proof of other perversions. Here at last the men are at least believable in their reactions to each other. But when Stevie returns, exacting her final revenge, it all rings false, because it's based on a love we never believed to be true. Part of the disconnected feeling of this production may result from its being presented on the large Grandel stage instead of the smaller Rep studio space, where most of the "studio series" is done. Playwright Albee apparently has rules about his plays not being presented in small venues -- and that's a shame. A more intimate theater might have helped both audience and actors engage more deeply with the material. In Who's Afraid of Virginia Woolf?, Albee's three-hour-plus masterpiece of dysfunctional relationships, audiences return after two intermissions, drawn into the outrageous but completely believable world of George and Martha. The Goat, or Who Is Sylvia? plays an hour and 40 minutes with no intermission. Albee must have realized that people wouldn't feel compelled to come back.